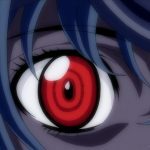 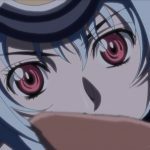 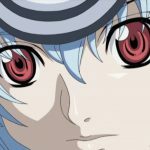 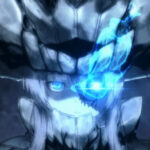 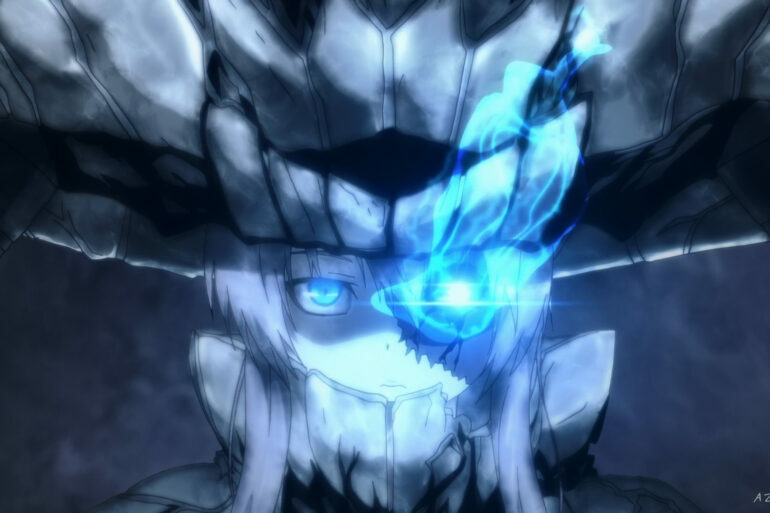 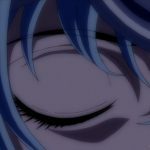 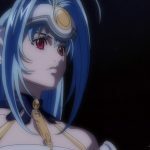 KOS-MOS has long blue hair and red eyes. 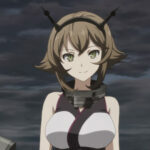 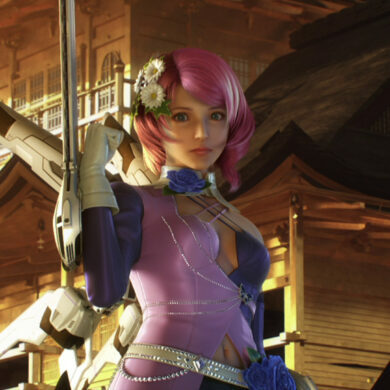 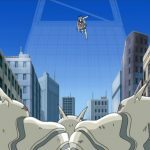 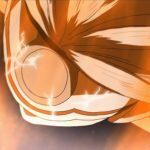 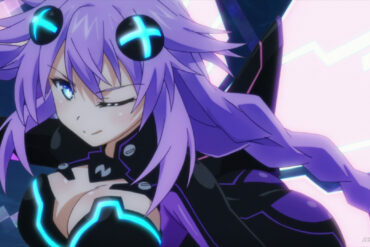 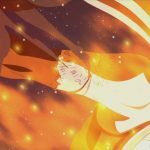 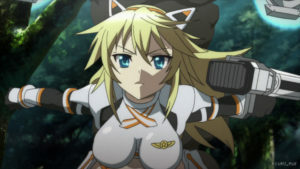 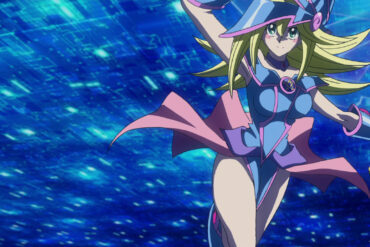 She has a visor which she uses during powerful attacks. 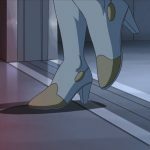 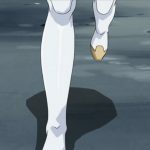 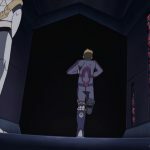 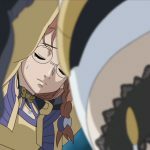 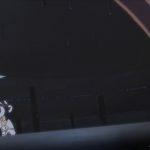 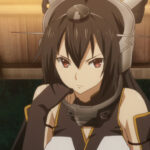 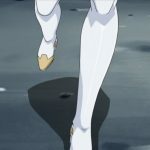 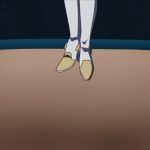 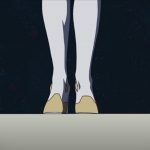 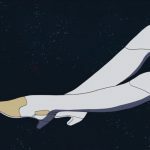 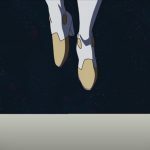 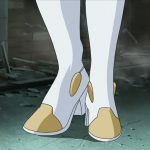 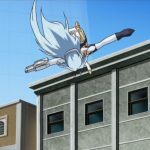 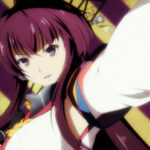 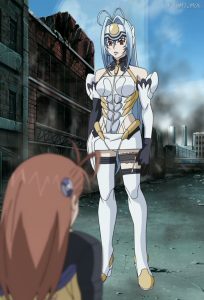 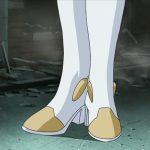 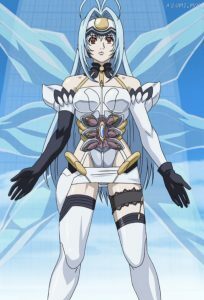 She wears a white bodysuit with yellow armour, long white and black gloves, and long white boots with black stockings. 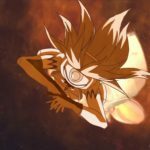 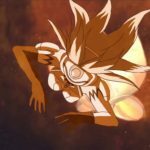 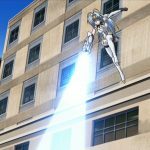 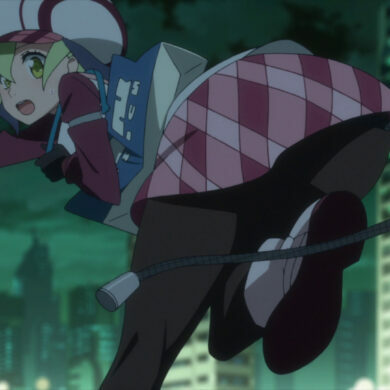 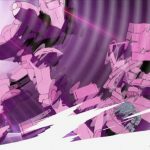 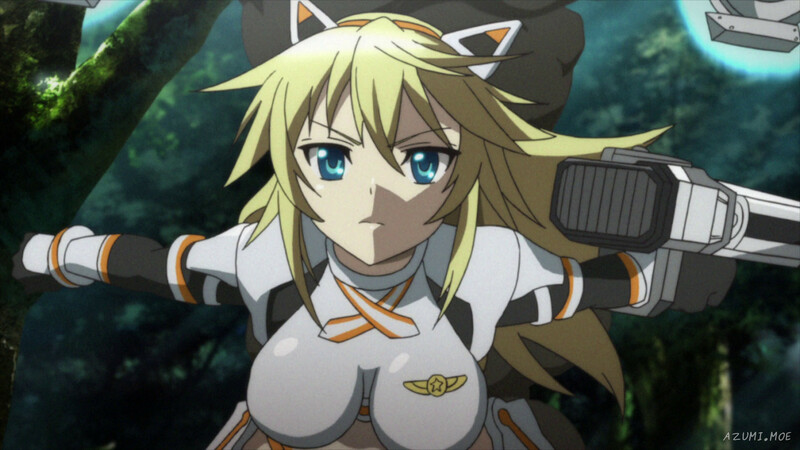 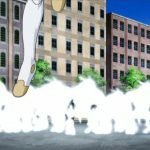 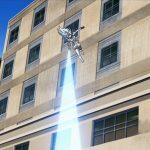 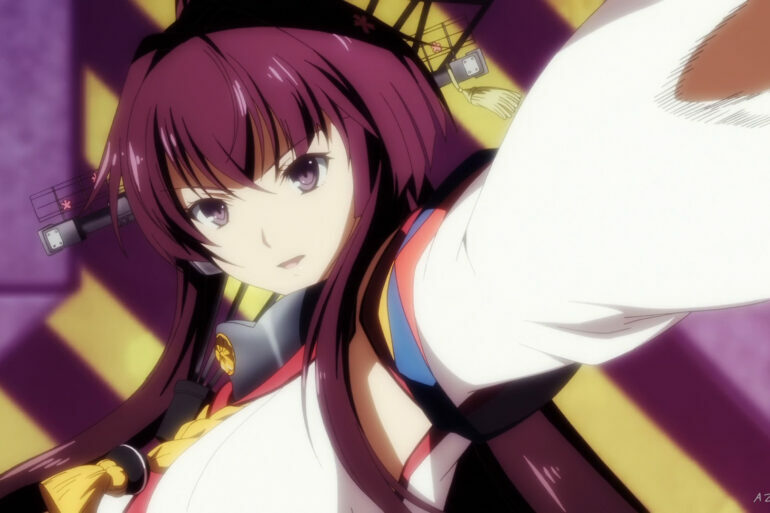 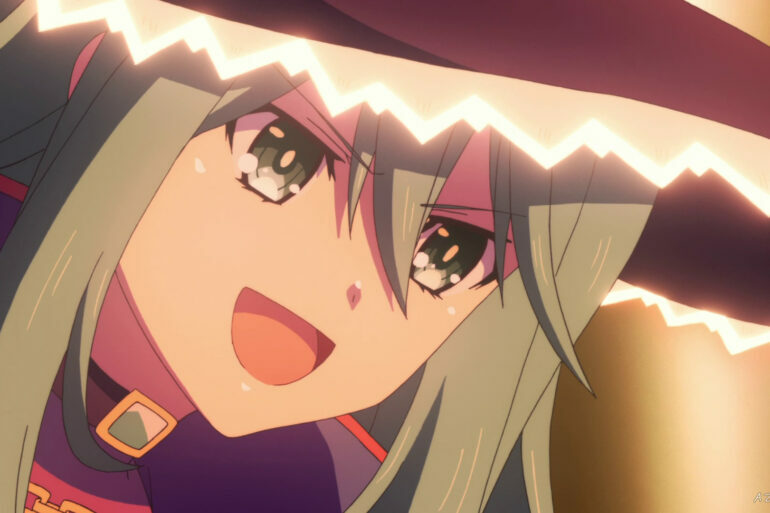 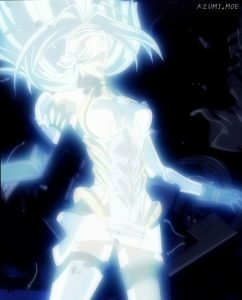 She also has a powerful X-BUSTER beam attack. 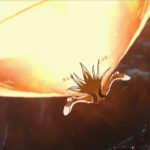 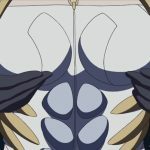 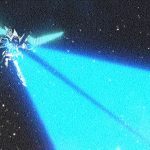 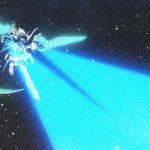 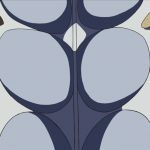 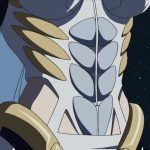 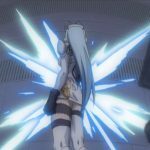 When KOS-MOS uses this attack, her abdomen opens outwards. 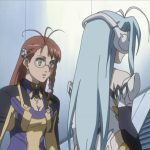 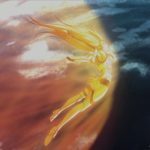 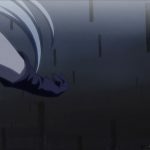 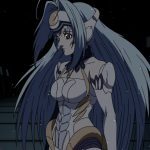 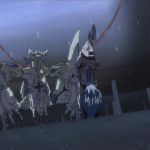 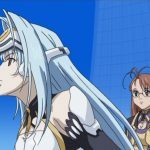 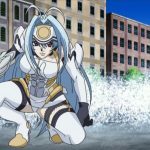 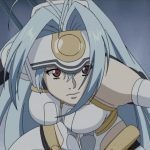 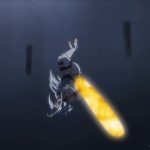 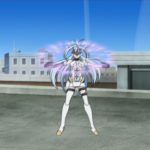 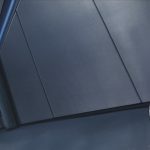 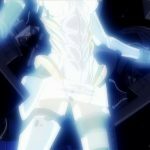 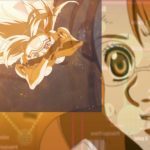 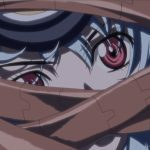 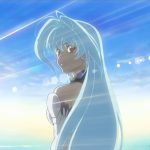 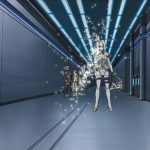 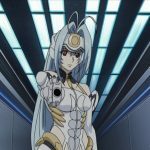 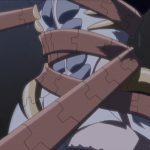 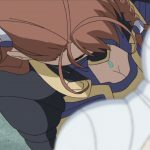 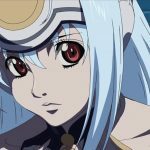 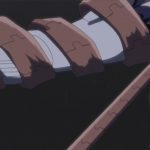 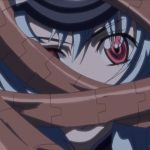 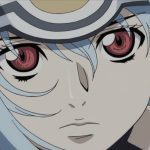 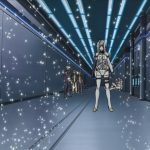 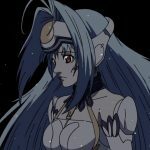 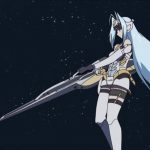 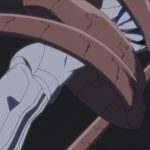 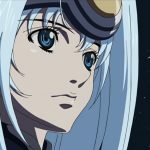 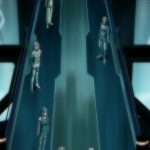 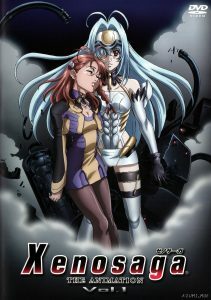 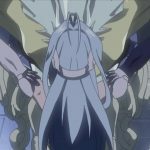 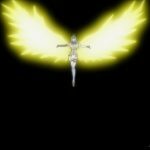 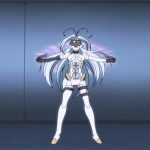 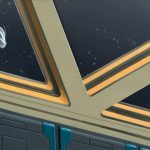 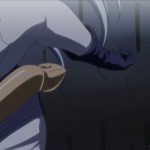 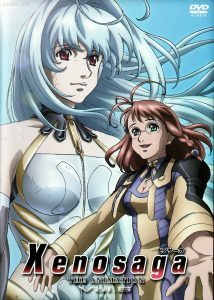 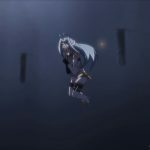 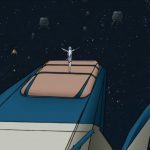 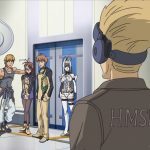 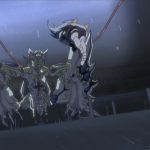 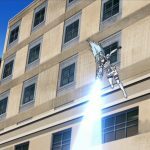 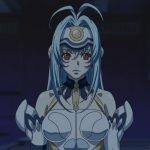 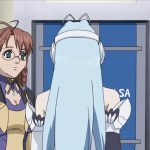 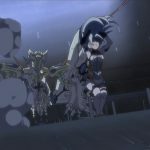 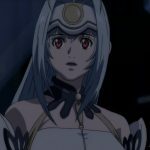 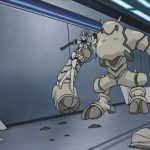 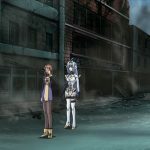 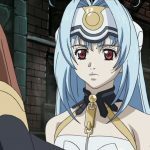 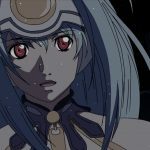 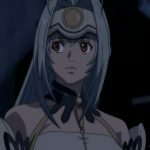 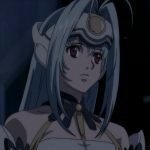 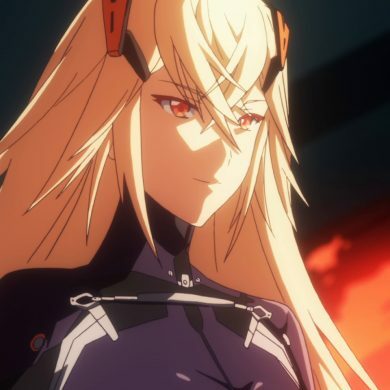 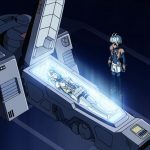 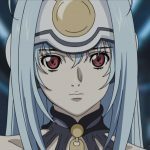 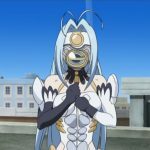 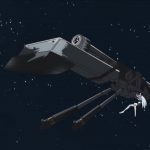 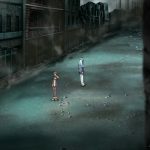 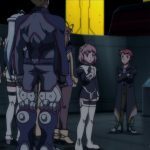 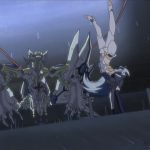 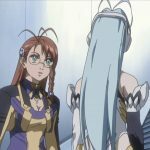 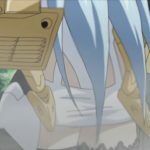 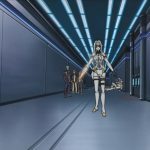 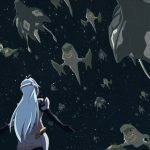 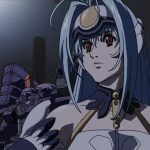 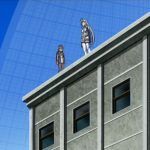 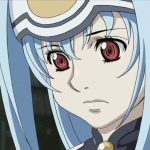 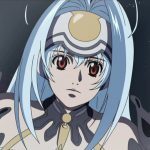 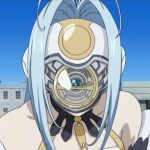 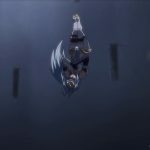 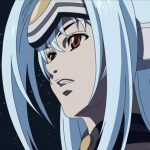 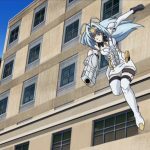 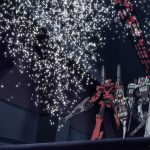 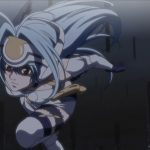 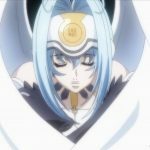 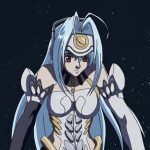 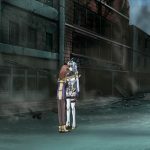 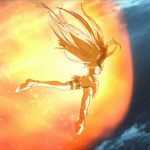 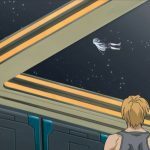 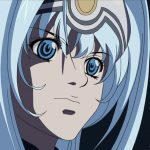 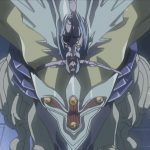 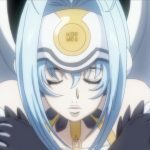 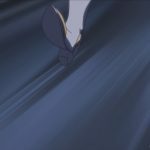 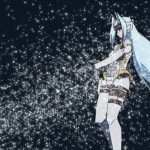 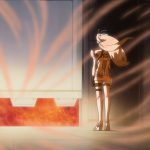 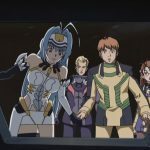 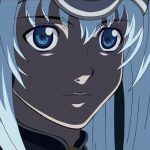 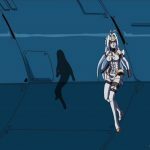 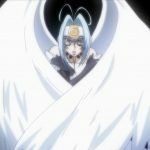 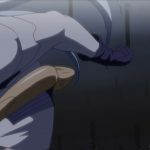 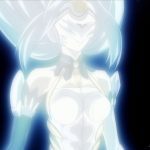 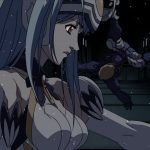 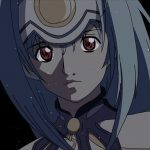 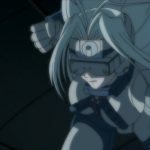 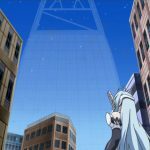 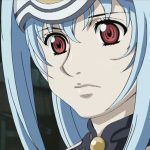 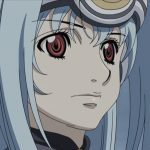 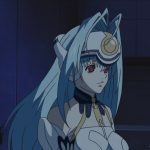 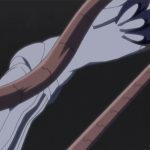 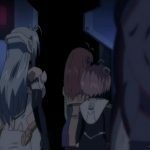 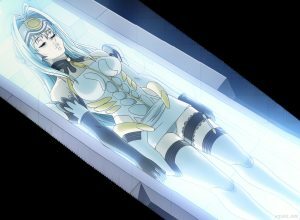 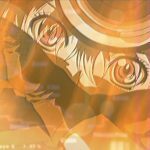 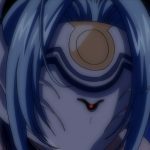 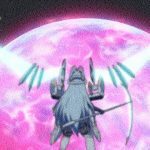 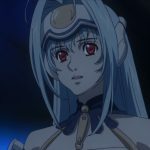 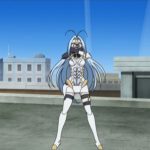 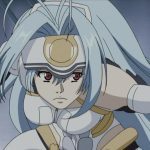 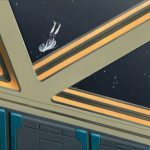 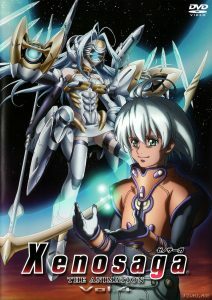 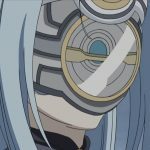 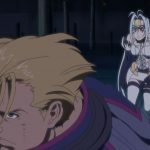 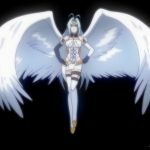 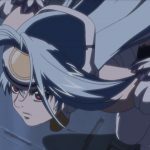 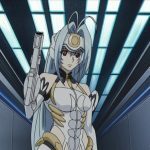 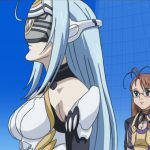 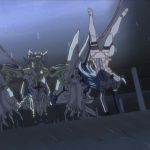 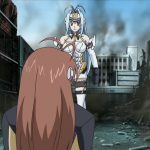 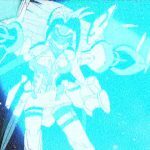 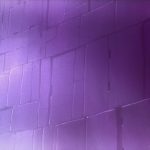 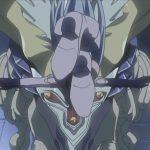 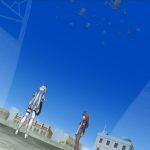 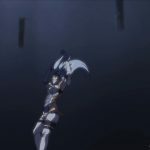 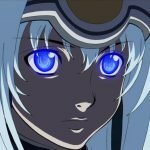 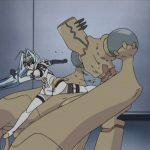 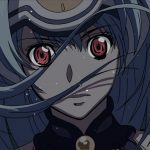 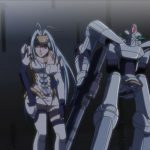 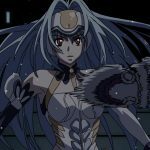 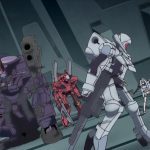 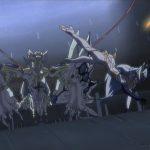 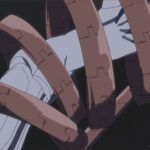 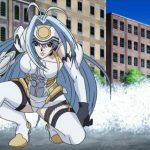 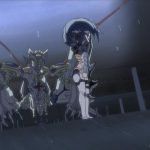 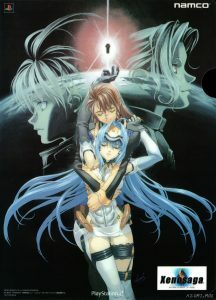 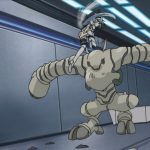 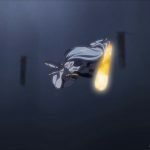 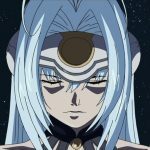 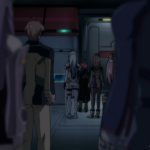 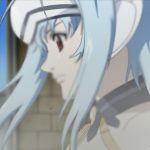 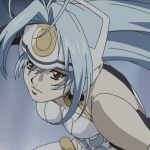 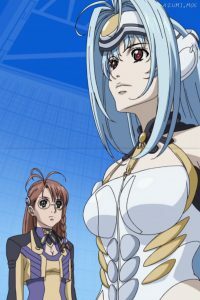 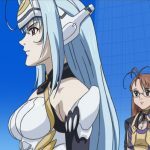 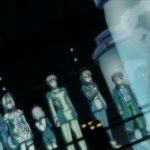 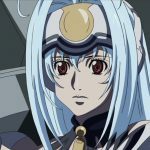 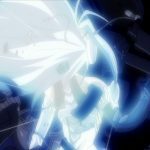 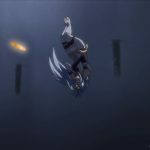 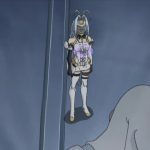 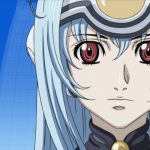 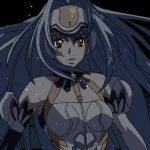 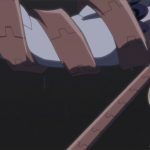 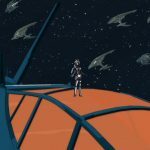 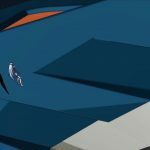 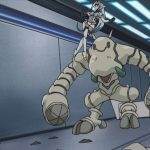 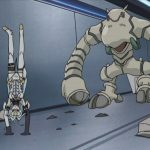 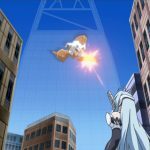 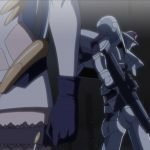 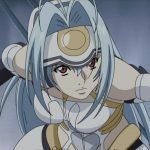 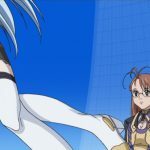 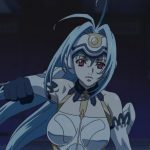 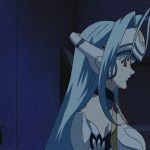 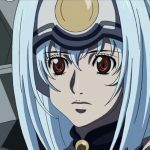 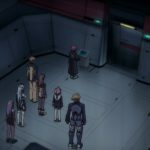 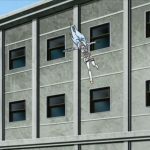 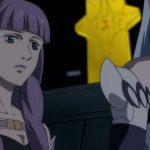 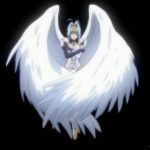 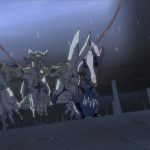 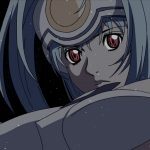 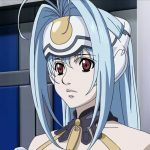 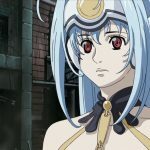 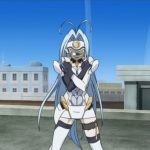 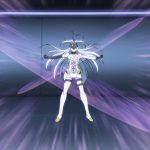 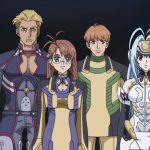 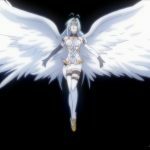 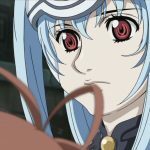 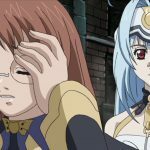 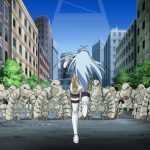 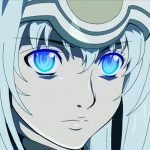 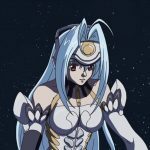 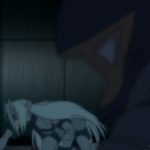 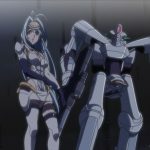 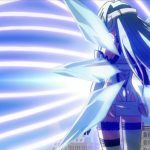 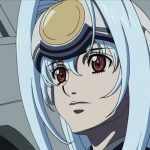 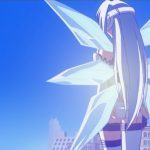 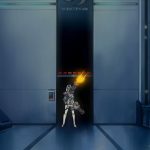 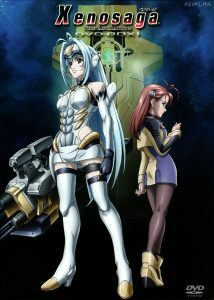 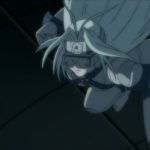 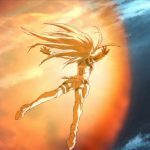 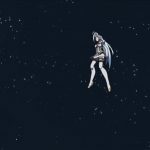 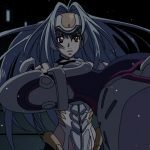 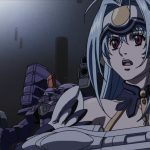 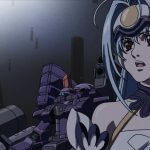 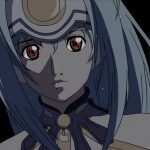 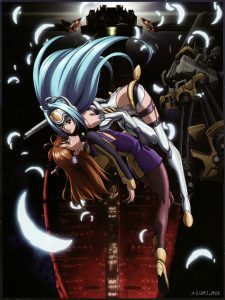 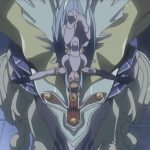 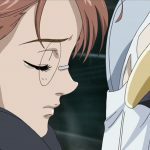 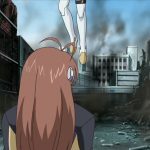 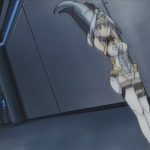 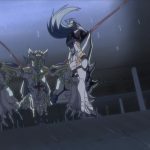 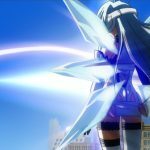 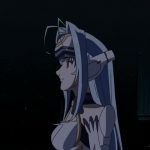 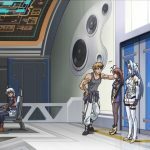 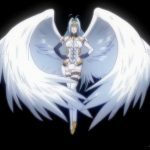 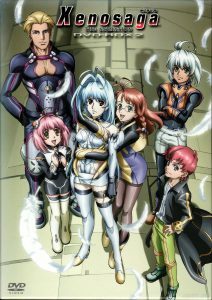 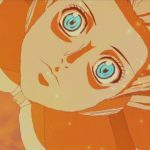 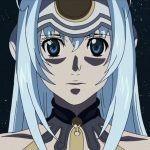 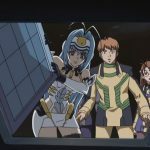 Below are visuals of KOS-MOS from Xenosaga: The Animation anime DVDs and the Xenosaga Episode I: Der Wille zur Machtnosaga PlayStation 2 game. 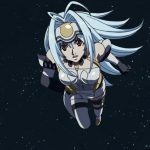 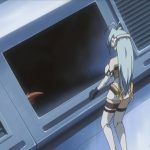 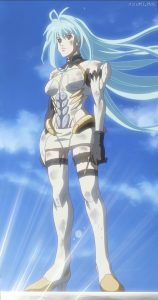 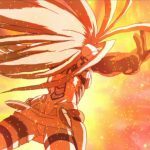 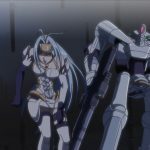 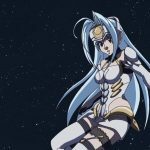 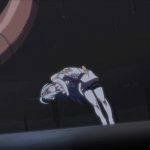 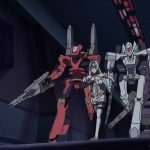 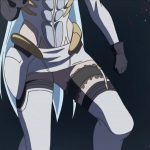 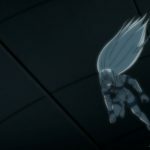 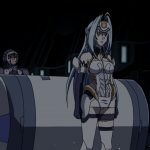 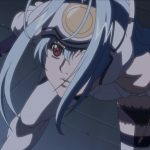 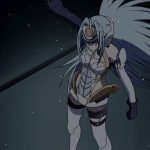 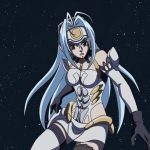 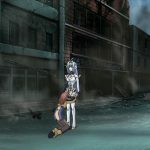 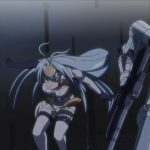 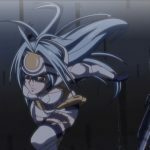 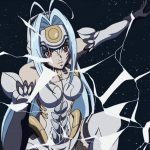 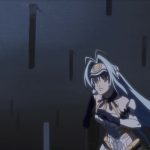 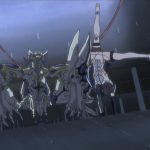 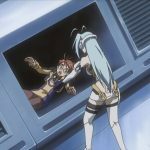 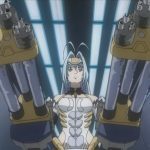 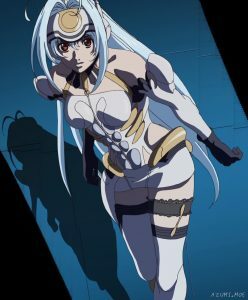 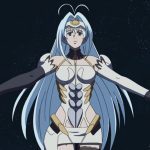 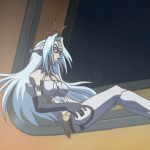 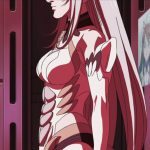 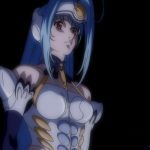 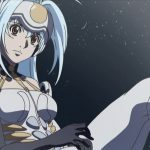 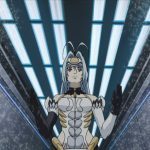 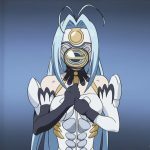 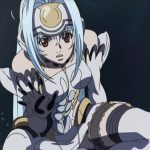 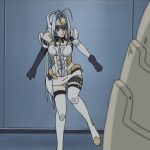 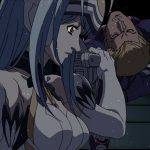 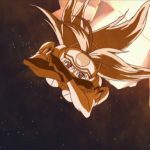 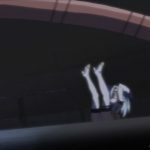 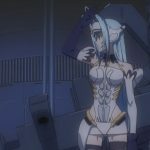 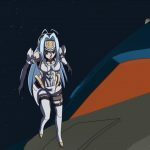 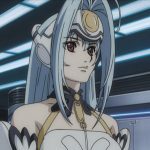 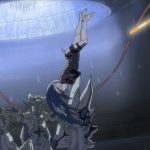 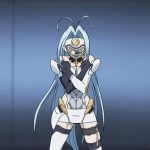 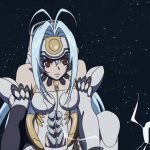 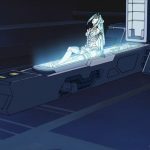 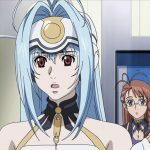 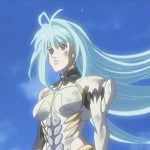 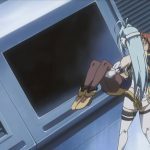 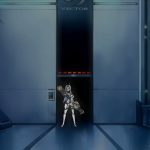 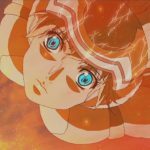 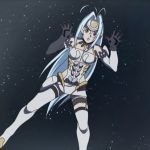 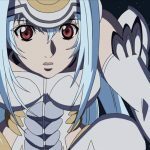 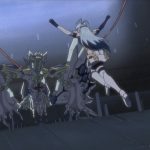 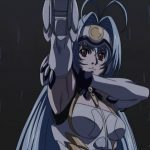 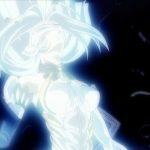 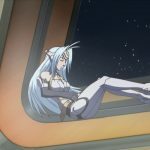 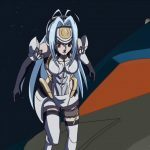 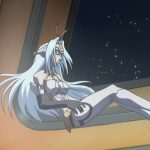 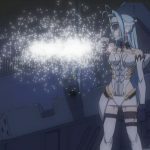 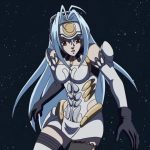 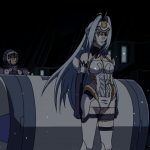 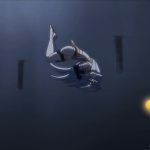 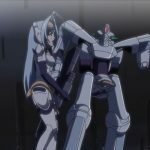 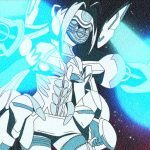 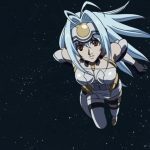 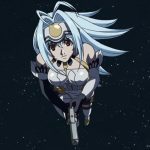 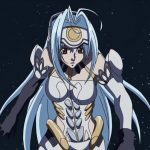 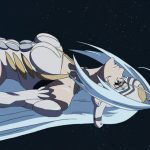 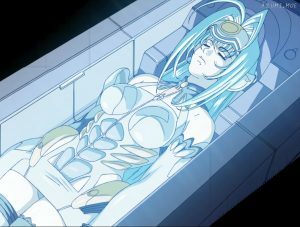 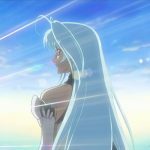 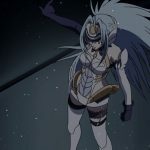 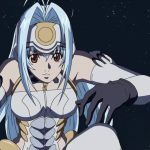 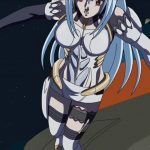 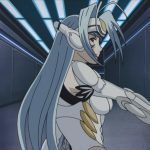 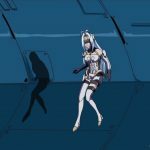 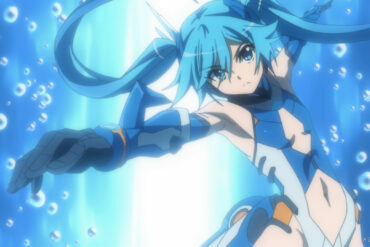 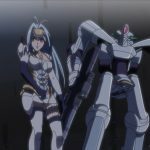 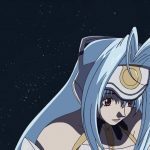 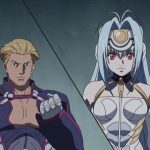 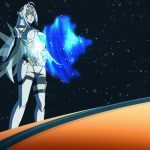 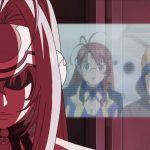 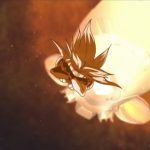 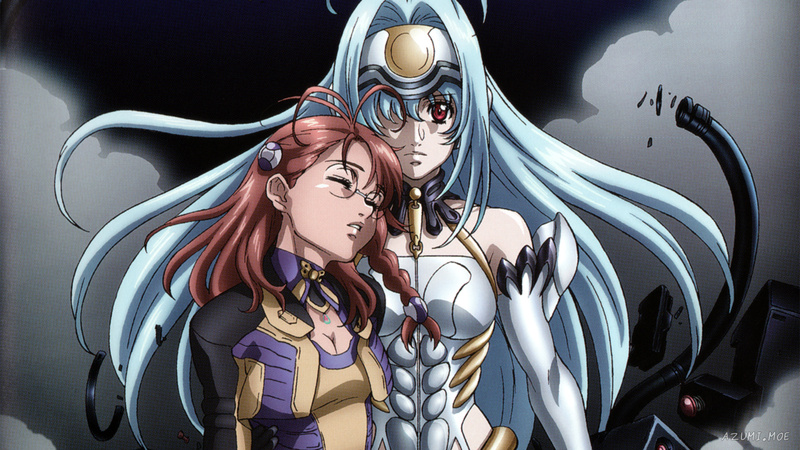 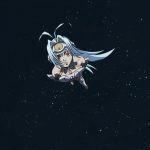 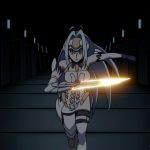 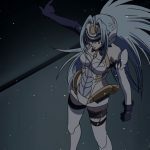 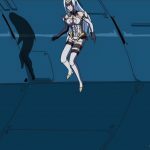 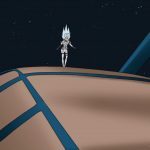 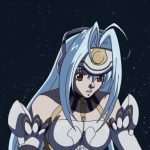 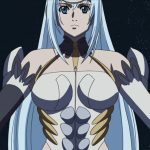 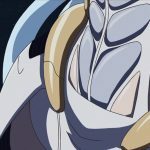 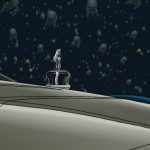 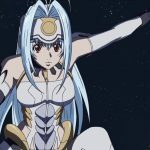 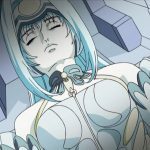 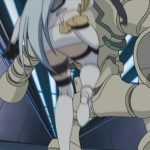 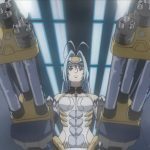 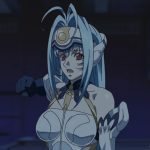 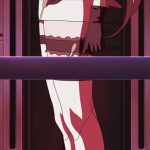 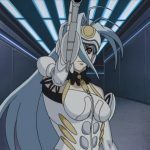 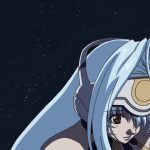 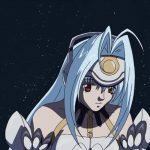 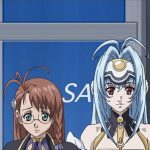 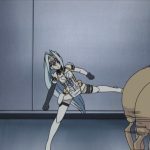 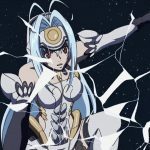 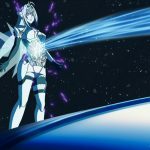 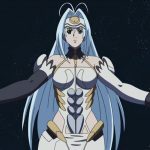 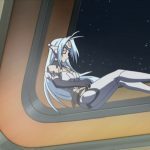 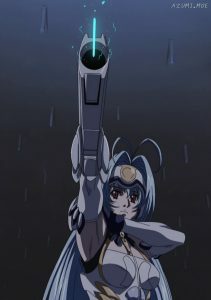 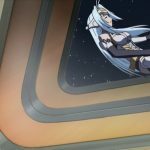 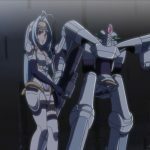 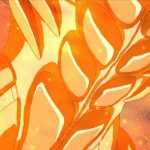 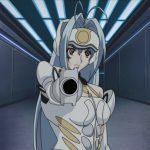 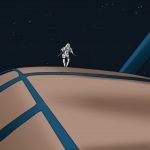 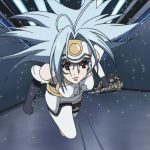 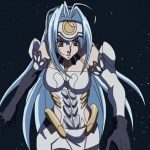 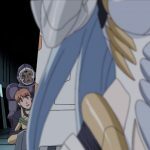 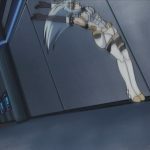 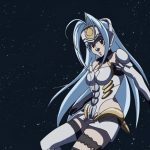 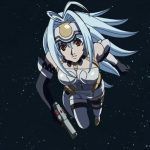 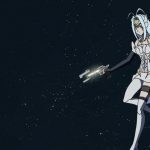 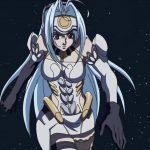 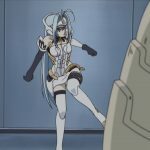 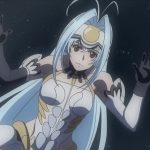 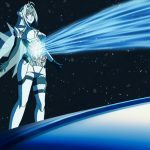 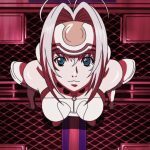 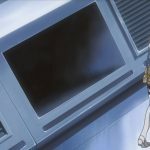 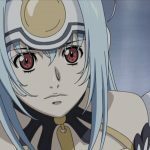 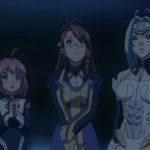 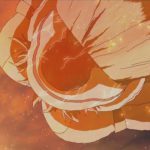 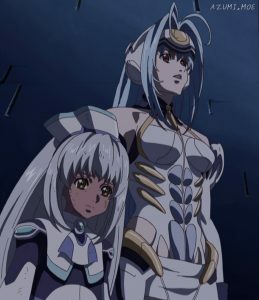 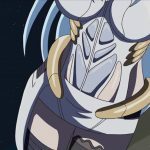 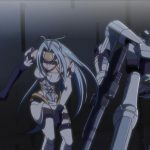 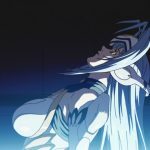 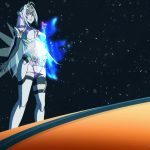 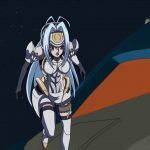 Below are special screenshot pinups of KOS-MOS, from the Xenosaga: The Animation anime. 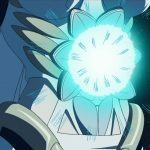 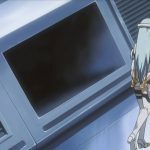 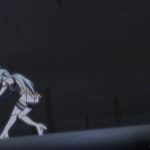 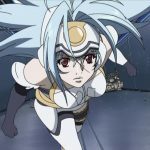 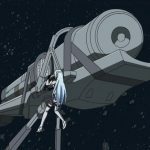 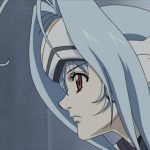 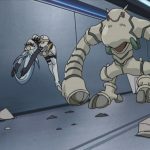 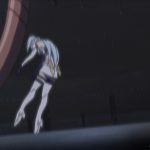 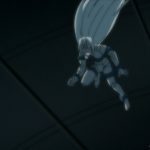 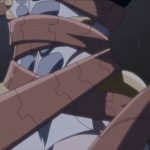 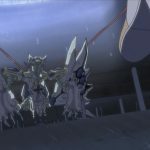 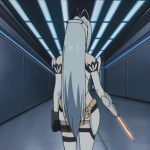 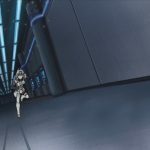 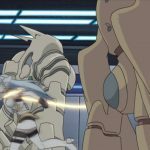 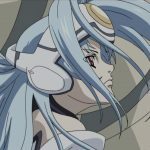 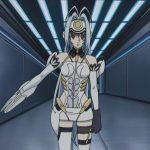 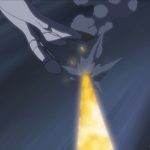 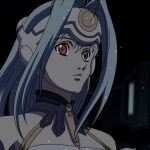 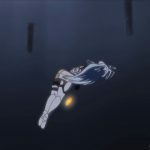 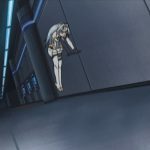 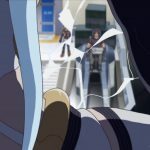 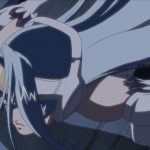 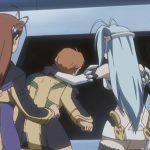 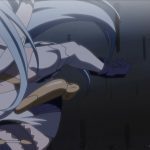 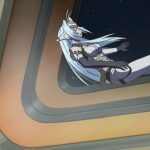 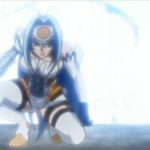 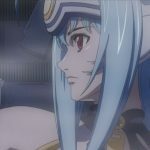 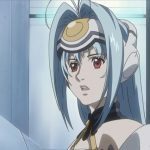 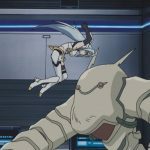 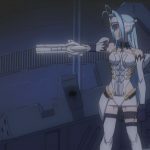 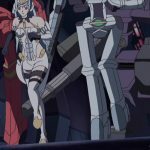 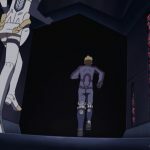 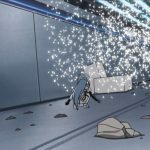 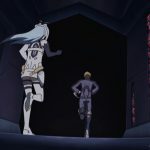 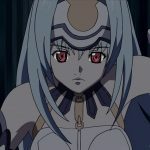 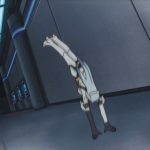 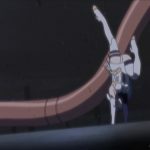 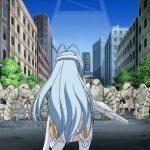 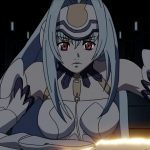 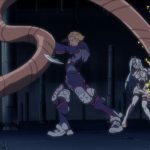 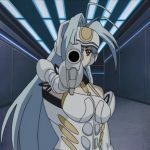 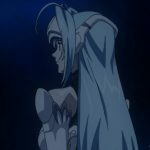 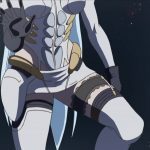 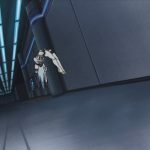 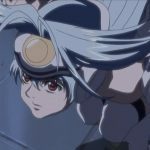 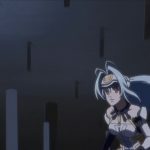 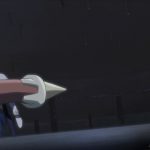 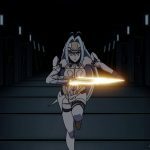 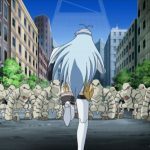 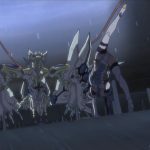 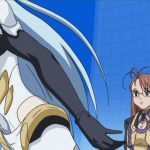 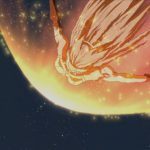 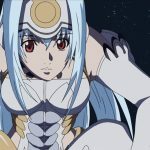 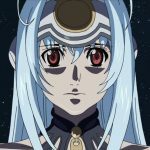 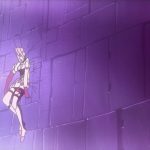 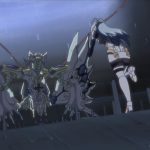 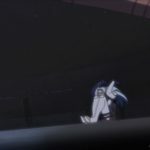 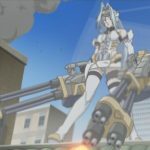 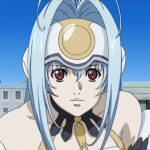 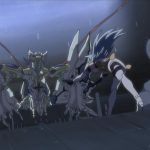 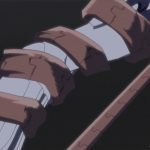 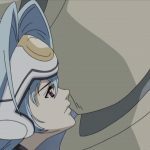 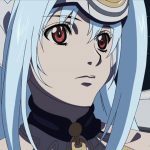 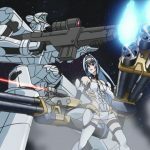 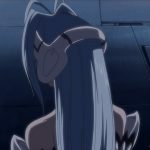 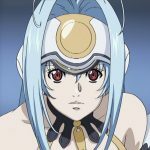 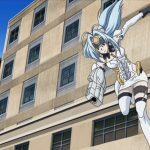 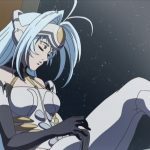 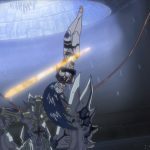 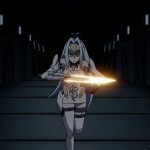 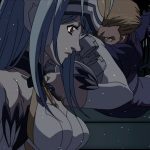 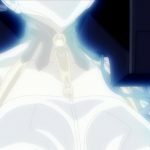 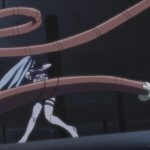 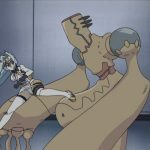 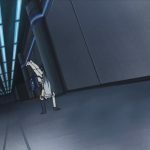 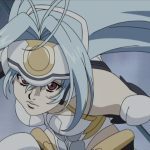 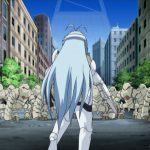 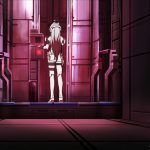 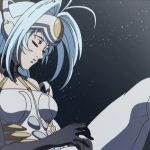 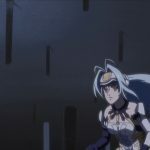 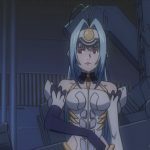 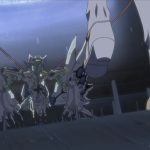 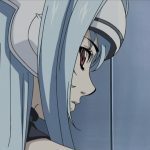 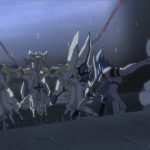 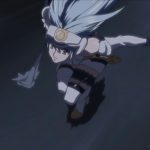 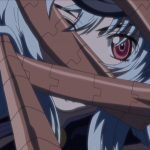 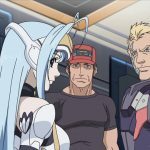 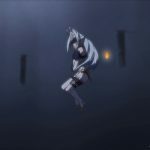 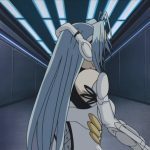 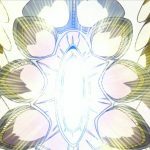 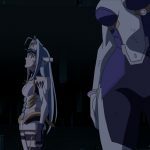 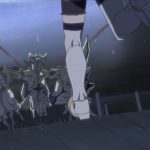 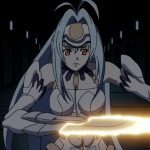 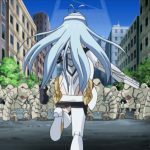 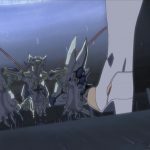 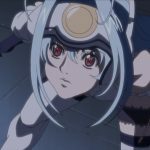 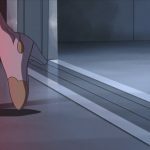 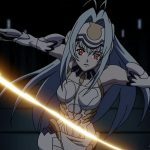 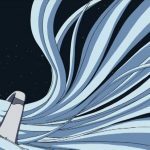 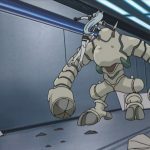 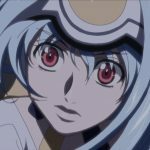 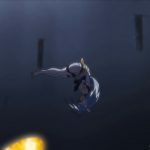 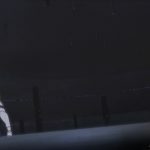 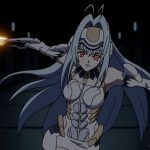 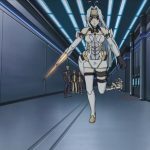 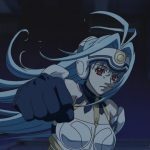 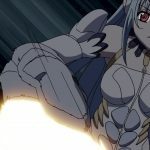 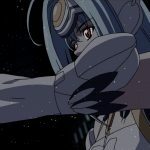 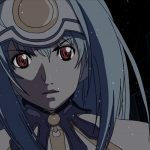 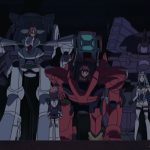 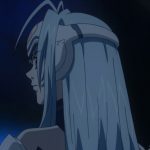 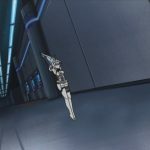 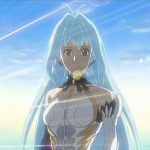 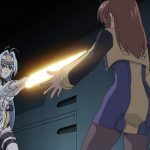 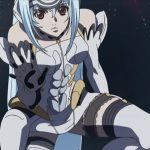 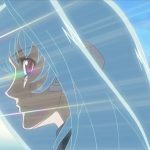 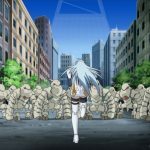 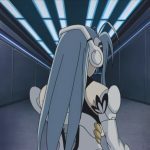 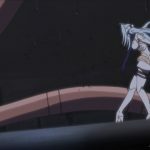 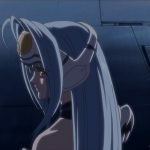 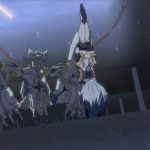 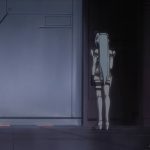 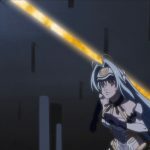 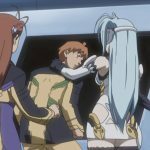 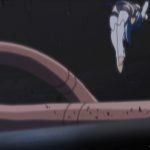 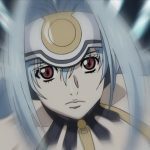 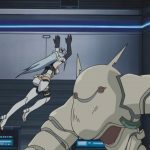 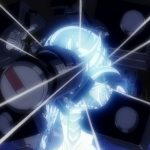 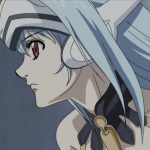 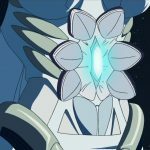 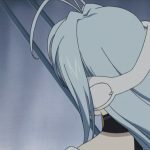 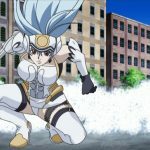 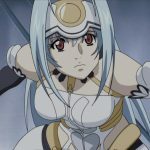 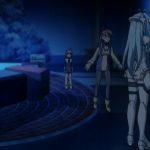 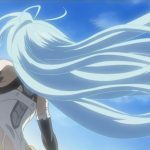 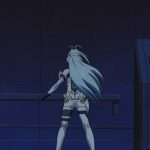 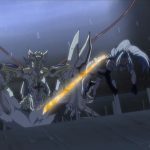 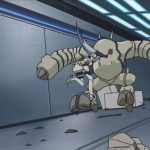 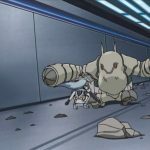 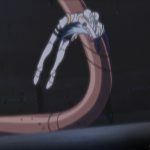 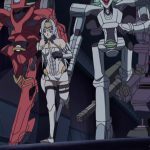 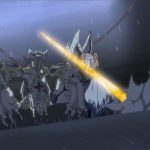 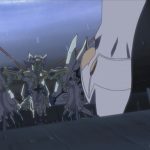 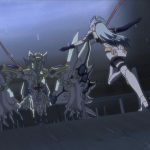 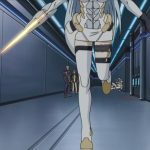 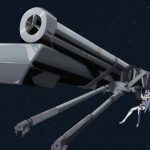 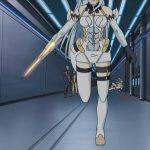 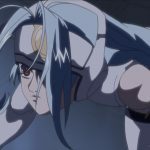 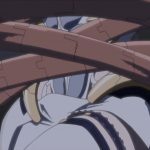 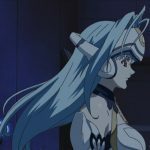 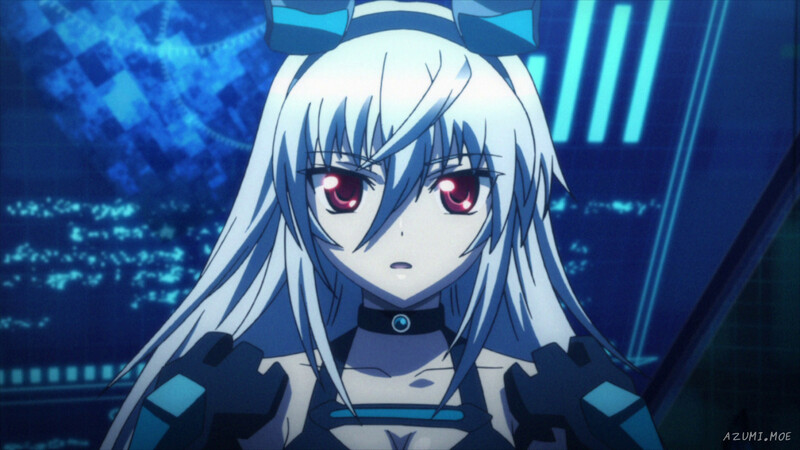 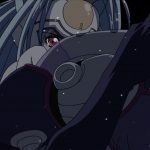 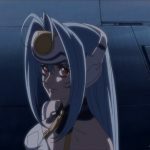 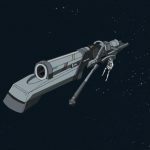 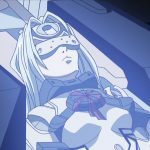 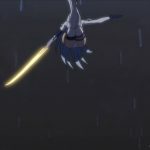 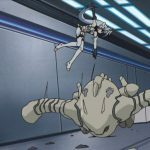 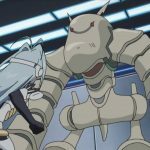 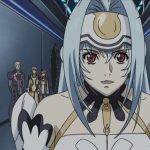 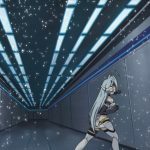 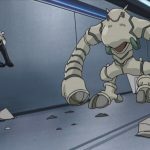 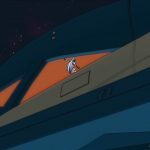 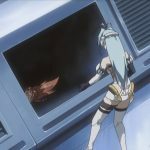 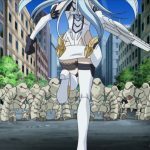 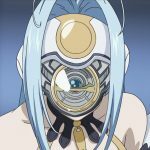 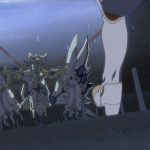 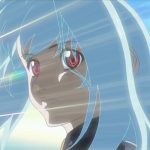 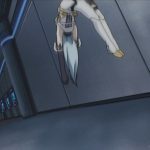 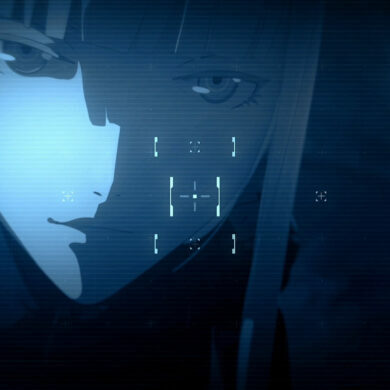 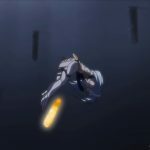 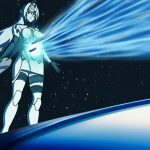 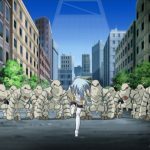 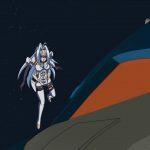 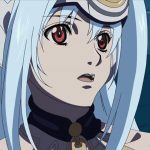 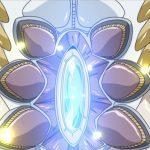 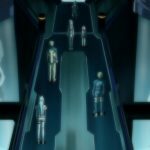 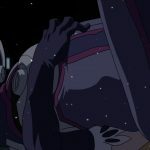 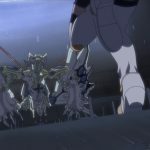 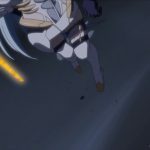 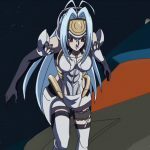 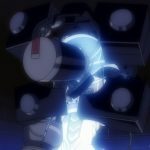 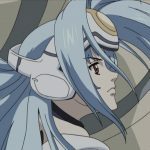 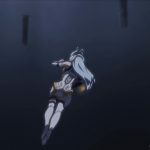 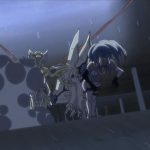 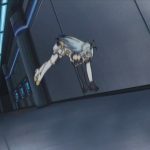 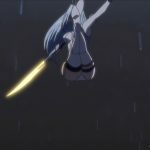 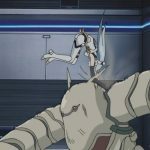 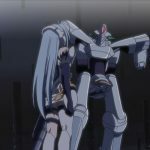 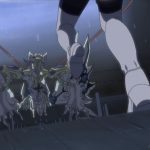 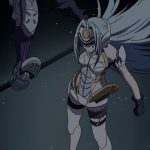 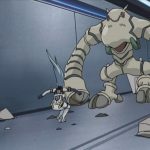 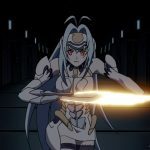 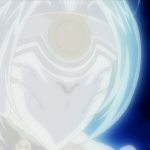 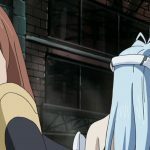 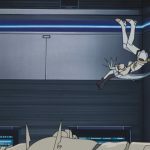 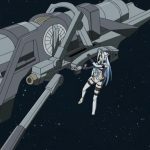 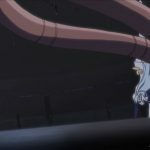 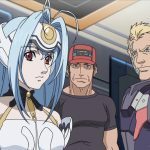 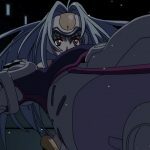 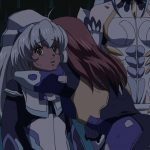 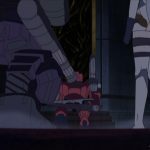 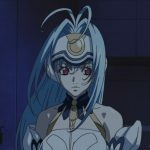 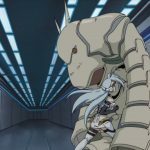 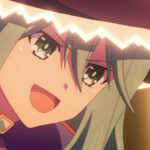 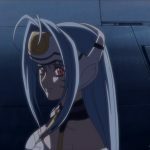 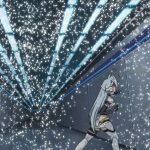 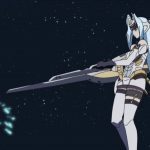 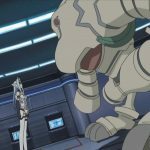 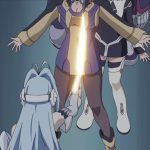 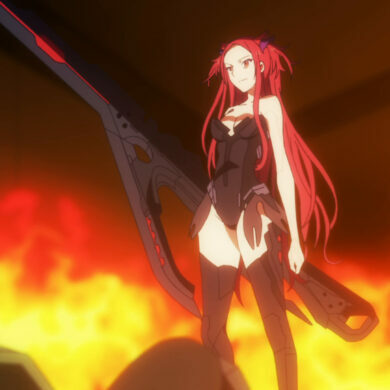 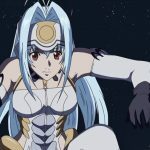 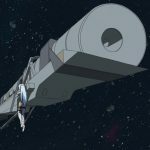 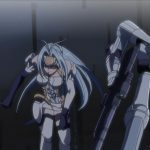 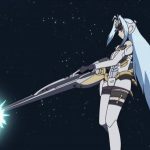 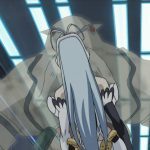 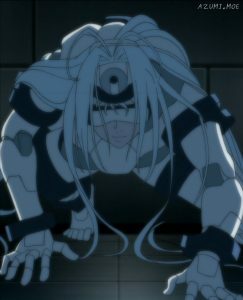 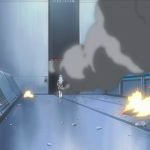 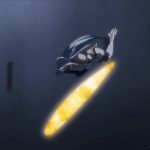 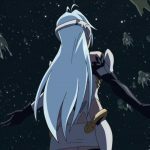 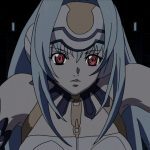 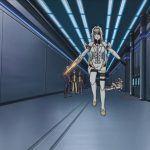 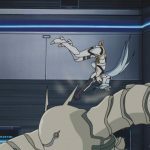 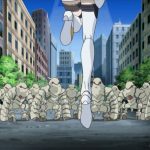 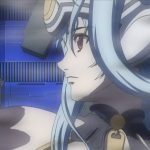 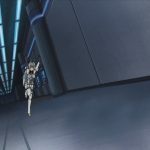 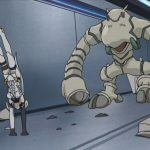 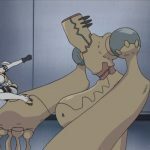 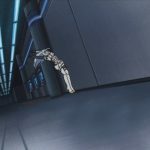 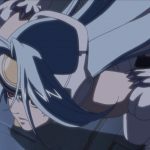 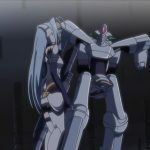 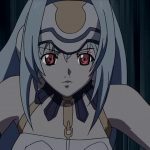 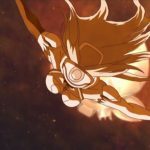 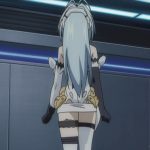 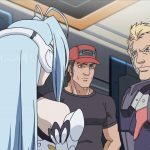 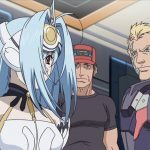 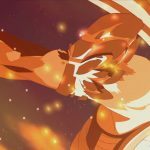 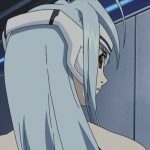 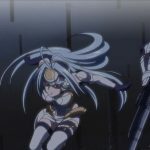 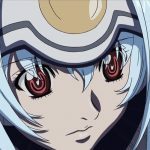 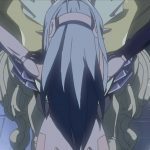 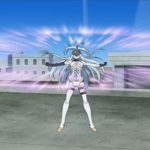 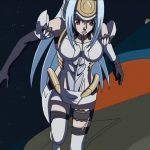 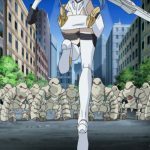 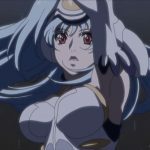 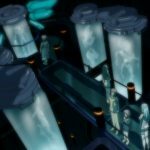 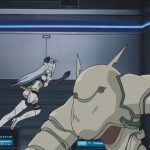 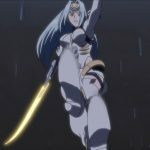 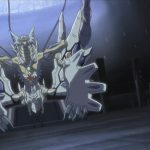 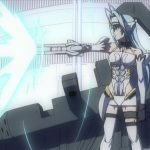 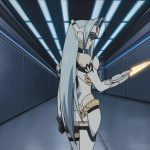 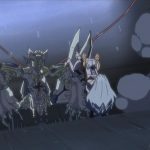 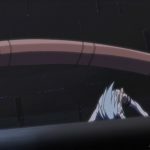 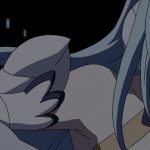 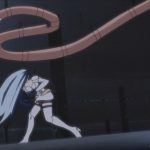 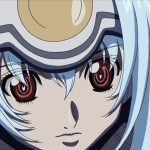 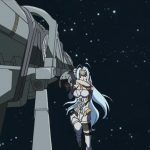 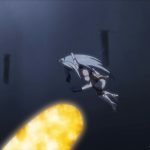 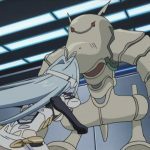 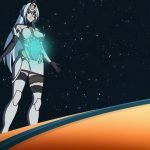 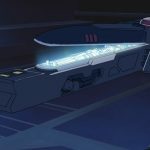 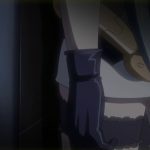 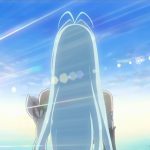 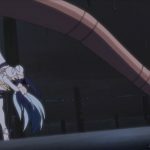 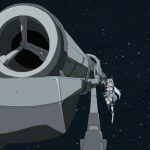 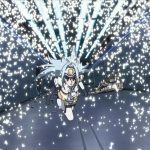 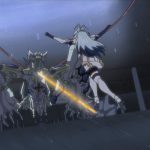 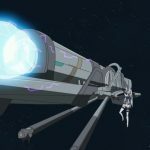 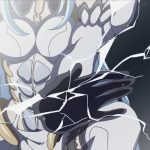 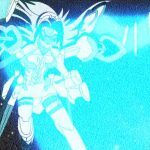 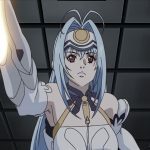 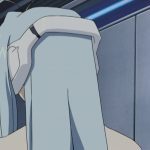 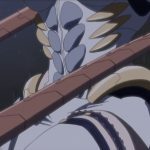 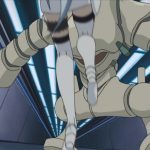 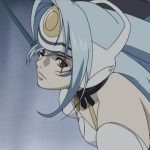 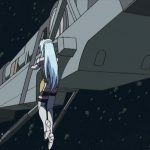 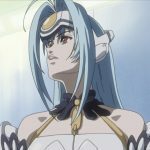 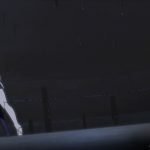 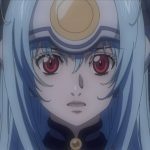 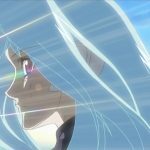 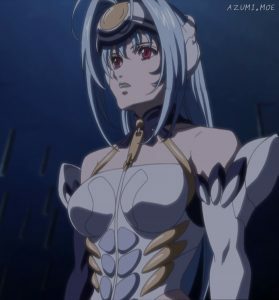 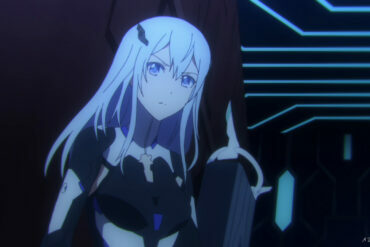 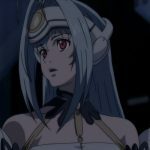 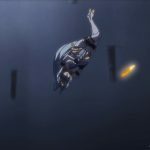 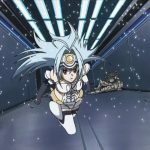 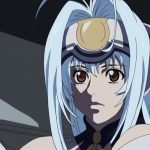 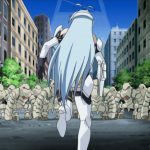 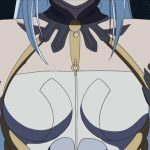 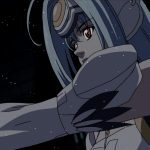 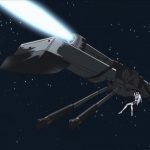 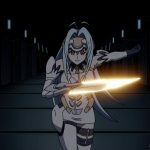 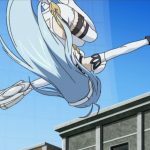 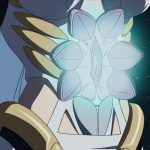 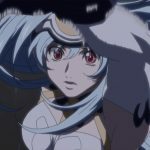 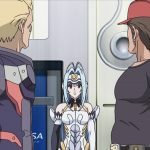 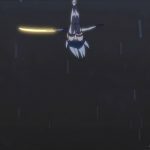 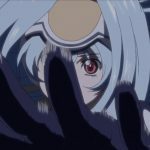 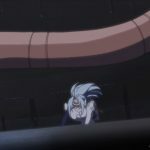 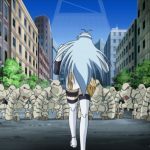 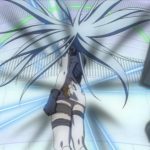 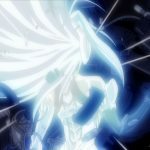 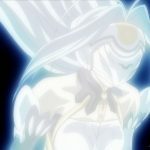 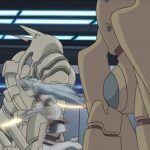 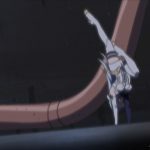 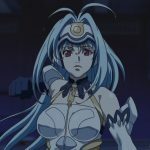 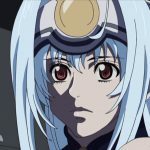 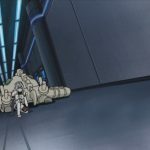 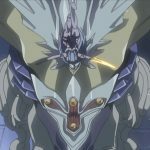 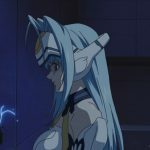 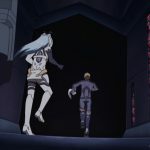 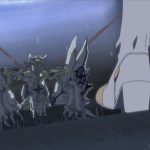 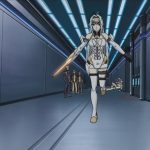 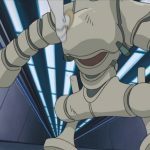 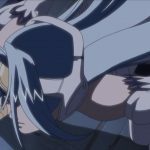 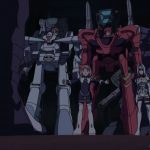 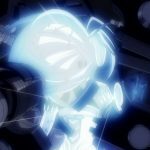 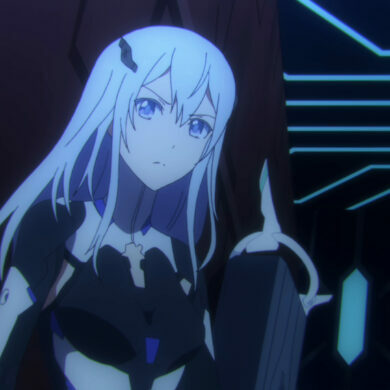 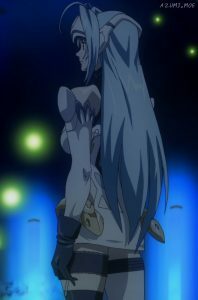 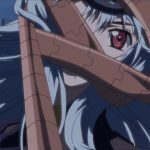 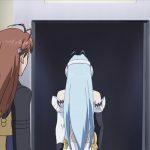 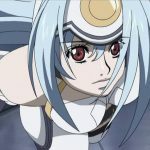 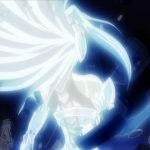 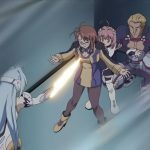 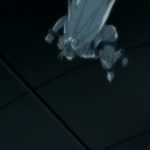 Below are screenshots of KOS-MOS, from the Xenosaga: The Animation anime.